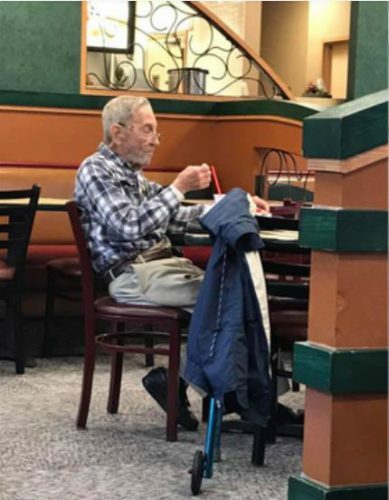 A 97-year-old war veteran visits his local Arby’s fast food restaurant and orders the same meal every day. There’s hardly a day that passes where the employees at the fast-food restaurant don’t see the meat lover arrive at the establishment for his “regular” order. Staff first got to know the World War II veteran Doug when he started to show up at their place of work every day. Once they heard his story and found out more about this war hero, they did something so special, which has touched the hearts of the whole country. At 97-years-old, World War II veteran Doug know what he likes. He orders his ”regular” meal each day: a roast-beef slider with Swiss and a senior drink… Coke with no ice. Some employees decided they wanted to know more about him since he was such a regular. 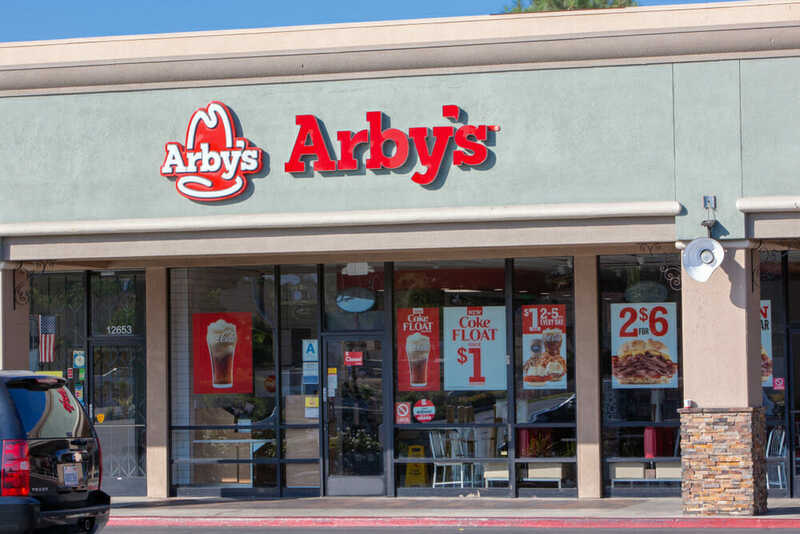 The employees took a moment out of their busy lives to sit down ask Doug a few pointed questions: “Hey, Mr. Doug, we just want to know what keeps you coming back to this Arby’s location?”, according to a source. Doug returned with a comment to reminded the employees how short life can be and the importance of appreciating each thing we have while we are here as it can be ripped from us in a moment. Christina then added that when she started working at the restaurant about 32 months ago, Doug started making it part of his daily routine shortly thereafter. Christina said Doug has been visiting the same Arby’s nearly every day for over two years. “He’s gone through a lot being a veteran, coming in, being in a retirement home, but he doesn’t have family,” she said. Staff decided they wanted to do something for Doug, who risked his life serving his country during World War II, so gave him a $200 gift card. The manager said, “He was shocked, hardly had anything to say,” the manager said. 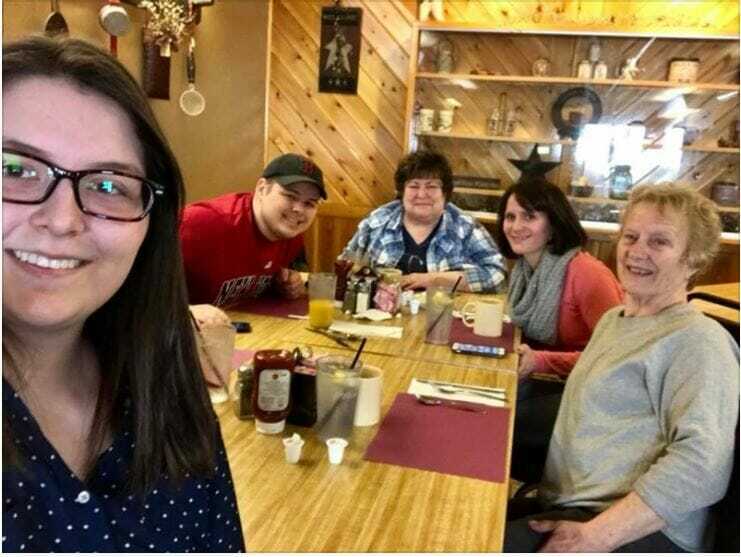 As Doug doesn’t have his own family support network staff gave him their cell numbers, as well as deliver his favorite meal to his door, if he wasn’t able to make it to the restaurant. Arby’s decided to give Doug food for life, which will begin once he uses up that gift card. A local eye doctor also stopped by the restaurant to provide Doug with a free exam and glasses. Police officers often get bad publicity, however, there are still numerous police force members who go above and beyond to help those in need. This particular story is an example of one. Kori Malenfant and her parents found themselves stuck at the train station in Boston in the middle of winter, following a brain surgery. Kori suffered from Chiari malformation, which occurs when there is an opening in the skull and a part of the brain starts to leak through into your spinal canal. The young woman was travelling home from New York to Protland, Maine four days after her procedure. Unfortunately, their train from New York ran late and they missed their connection in Boston by just minutes. 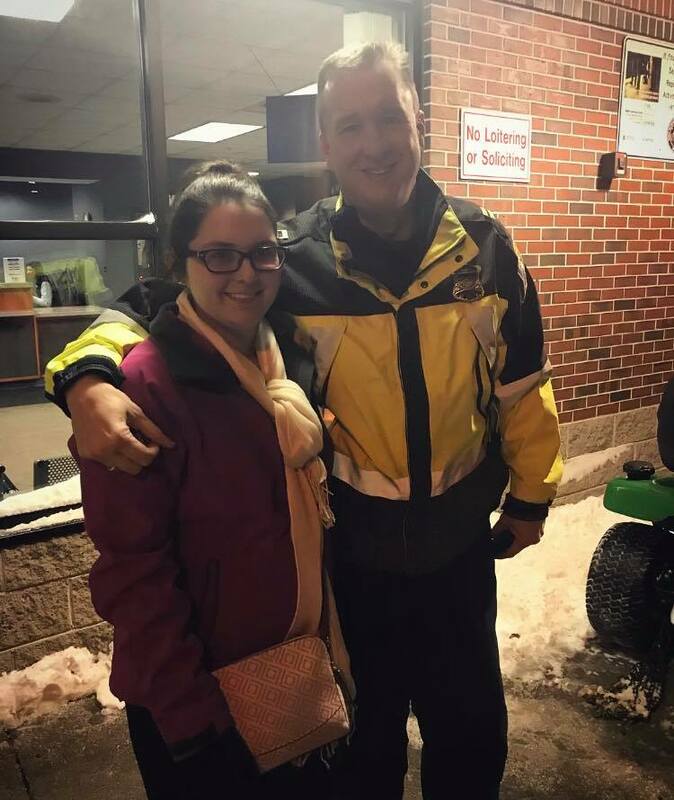 It was the middle of night and the weather was freezing cold, so Kori’s parents approached a nearby police officer to see if they could store their bags somewhere safe while they found a warm place to wait. What he did instead left them stunned. Kori was on route home following surgery when she found herself stranded, in undesirable conditions. “Because of the recent inclement weather and train cancellations, our Amtrak train trip back from the Presbyterian Hospital in New York was longer than expected, which caused us to arrive in Boston too late to get on the next train,” Kori wrote in her Facebook post. Kori’s mom desperately approached two on duty police officers to check if they could store their luggage somewhere else within the train station. Their plan was to take a taxi to a warmer place to wait for their train. “The officers quickly assured Mom that they would help us by contacting their captain to see what he could do. Shortly after, the Boston police captain came to us and asked us to follow him,” Kori explains. Initially, the family thought he would drive them around to keep warm, so they were grateful for his generous actions. But they soon realized that he was driving further and further north. “Mom asked where we were going, and he laughed and said he was kidnapping us and that it was perfectly legal. We soon realized he was driving us all the way to Portland, back to our car,” Kori says. The family were emotional over Captain McCormick’s heartwarming gesture. 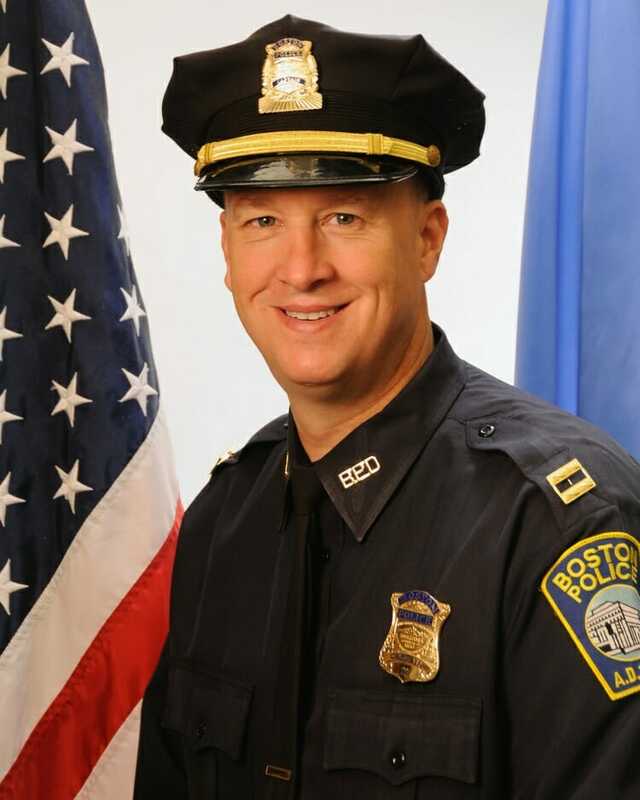 During the trip they traded stories, and the family soon learned that he was one of the main commanders in charge during the Boston Marathon bombing. Boston Police Superintendent-in-Chief William Gross wasn’t surprised by McCormick’s generosity. He said that this kind of thing just shows who McCormick is. “That’s not a one-time thing with Captain McCormick,” Gross said. “He’s always giving. He’s a very free-spirited and giving individual. He has a great soul… The mayor’s allowed us to put captains in each of our 11 districts that do get it, that do go above and beyond,” he continued. For many children testifying in court about abuse can be a terrifying experience. Appearing in court can add even more trauma to what originally happened. That’s where therapy dogs like Rasta can be helpful. Rasta is a 4-year-old golden retriever who works in Platte City, Missouri. He stands by young victims while they take the stand, allowing them to hold onto his fur as they speak about their horrible memories. Recently he has received an award for accompanying two young sisters to court in January to tell a jury about the sexual abuse they endured, from the county. Rasta’s job is about more than just comfort — he actually improves the chances of justice. Platte County prosecutor Eric Zahnd explains how therapy dogs are used across the country to help child victims comfortably tell the truth. “What we have found is that having that dog present, either during a deposition or even while that child is testifying on the stand, that because the animal helps the child become more comfortable that we do a better job of eliciting truthful information about some really terrible things that may have happened to that child,” Eric explains. Would it be nice to see dogs like Rasta become standard procedure in every prosecutor’s office in the country! The following story is what sickens animal lovers. An ‘abandoned’ horse collapsed in front of shocked crowds outside the Principality Stadium in Cardiff city centre. Outside the Principality Stadium, the female pony was pictured surrounded by concerned onlookers who attempted to get her to her feet in the blazing sunshine. In some other photographs, a horse-drawn carriage can be seen next to where the animal fell with a handwritten sign stuck to it that read: “Free to a … home”. The following note was attached to the buggy beside the horse. The exhausted mare collapsed as a result of being out in the heat for ‘hours’. Sandra Kvaerneng Stolp – from Whispering Willows Sanctuary animal rescue centre, based in Swansea was one of the helpers tasked with collecting the animal. Speaking on a video that was posted to Facebook, she said: “We were called by the police. A horse had been down on Westgate Street for a couple of hours. It had collapsed on the road. The horse in the middle of the street. “We did what we could and we got her up and she’s now in the back. She’s munching on her hay, it was the hay that got her in the box. Since the incident two people have been arrested on suspicion of offences under the Animal Welfare Act. People rallied around the horse. Shockingly, this was the second time the sanctuary were called out to help a horse over the Easter weekend. On Friday 19 April, a pony nicknamed ‘Gary’ collapsed in a Lidl car park and also Sandra travelled to rescue him. A campaign back by 500 people has begun in order to save Gary. Sandra Kvaerneng Stolp agreed to buy him from the owner for £2,000 ($2,599). Earlier this year, Dakota Nelson and his wife Ream were goofing around in their garage. Just like any other day the happy couple were messing about with teach other. Dakota left the garage for a few minutes to grab some tools , however when returned to find his 38-year-old wife Ream was on the floor, unconscious. Her face was blue and she didn’t appear to be breathing. Dakota attempted CPR while their 11-year-old son called 911. Rema’s brain was without oxygen for 20 minutes, despite being in a coma for several weeks, she eventually passed away. Doctors were uncertain what caused her to pass suddenly. 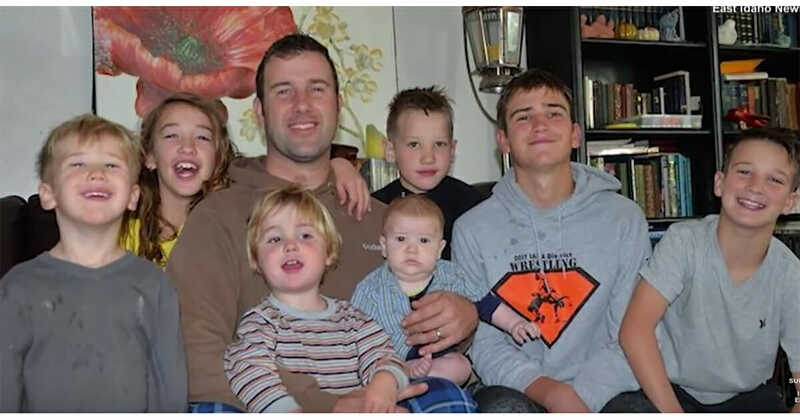 All of a sudden Dakota fond himself left to raise their seven children, ranging from age 1 right up to age 16, as a single father and grieving the loss of his wife. He’s currently working three part-time jobs just to pay the bills. That’s when an anonymous donor looking heard Dakota’s story and immediately wanted to help out. Little did Dakota realise the amount of the surprise he would receive. An amount that generous can go a long way toward helping Dakota in this most difficult of times. Once Dakota opened his gift, he was left absolutely speechless… then cried tears of gratitude. With so many different species of animals all over the world, it’s impossible to be an expert on all of them. Thanks to the internet it has given us a wonderful way to learn about things we may never set eyes on in person. Following a recent trip to Inida, an amateur photographer had no idea that he would be teaching people about a particular animal after he shared these images. Most people have never heard of Malabar giant multicolored squirrels, but now lots are obsessed with this exotic creature. Kaushik Vijayan first spotted the majestic animal while visiting a forest in India. Their unusual colors make them fascinating to look at with their black, brown, red, orange, maroon, and purple. He captured some pictures of them, whom he had never heard of before.“The squirrels fascinated me and I got excited to capture this beauty on my camera,” he explains. These Malabar giant squirrels are bright, beautiful squirrels look nothing like the ones you’re used to seeing. These squirrels are two times the size of an eastern gray squirrel, about 36 inches from head to tail. Kaushik Vijayan had never heard of the animals before seeing them in an Indian forest. “The sight was an absolute feast for my eyes,” the amateur photographer explains. Kaushik took the images in Pathanamthitta District in the southern state of Kerala. “The squirrels fascinated me and I got excited to capture this beauty on my camera,” he explained. Their vibrant colors can be seen in the sun. These animals are also very flexible. They barely touch the ground as they leap almost 20 feet, which helps them move from tree to tree. The squirrels are found only in eastern and southern India, as population dwindles they aren’t in immediate danger of extinction. “The real threat is the slow loss and degradation of forested habitats as humans move in and as climate change impacts higher elevation areas,” the squirrel expert explained. As population expands many animals have faced similar challenges. The squirrels are believed to be shy, he was lucky to notice two interacting playfully. Kaushik shared his shots of the beautiful animals on Instagram, where they instantly went viral. It’s been inspirational for the amateur wildlife photographer. “The response I see from the people on social media when I post a picture of the giant squirrels fuels my enthusiasm to go out there,” he explained. It certainly makes you think about appreciating the beauty that nature has to offer! If you enjoyed these adorable images then please SHARE with your friends on Facebook. A heartbroken pet owner has spoken out after her pooch was nearly killed when raisins – which can be fatal to dogs – were scattered across a public park. Steph Cookson was out walking her puppy, Bella, with her family in the park when she noticed Bella starting to eat something off the ground. Steph instructed Bella to “leave it,” however once Steph realized what Bella ate, it was too late. Bella had ingested 15 raisins, which are highly toxic to dogs. The smallest amount of either raisins and grapes can be fatal for any dog which can result in kidney failure within hours. Thanks to the quick thinking of both Steph and the emergency vets, Bella is on the mend. “We are keeping an eye on her and she has some bruising on her paws from where the cannulas went in, but she is glad to be home,” she continued. Steph was unsure if the raisins were scattered around the area of the park on purpose or just a mistake, she hopes her story will raise awareness about the danger certain human foods can cause to our beloved four-legged friends. As the weather begins to increase in temperatures a dog owner has shared a video showing the dangers of locking your pet in a car. The short video shows steam coming from its fur as it sits in the passenger seat. It was filmed during winter but shows how your dog would feel in a hot car. The short clip acts as a gentle reminder of the dangers for animals during such intense bouts of hot weather. Apparently 44 percent of dog-owning motorists claim they have left their dog unattended in a car on a hot day. Researchers also discovered that 70% admitted they had left their dog for an average of eight minutes, which is plenty of time for a car’s temperature to rise to unbearable levels. According to the RSPCA, in 24C heat a car can reach a sweltering 34C in just 10 minutes, and up to 43C after 30 minutes. If a member of the public notices a dog alone in a hot car, many don’t know whether to call the police, smash the window, or attempt to locate the owner. However, a study found that three million drivers (8% ) did not step in when they spotted a dog left in a hot car. The RSPCA has given its advice as to the best course of action if you see a dog locked in a car. The charity says: “In an emergency, it is best to dial 999 and report a dog in a hot car to police. The RSPCA may not be able to attend quickly enough and, with no powers of entry, we’d need police assistance at such an incident. A social experiment carried out discovered that only four out of hundreds of passersby stopped to help out Annie (a fake dog locked in a car in 28C heat) when the trial was carried out. Help us spread awareness of the dangers and SHARE this post with your friends on Facebook. 144 law enforcement officers were shot and killed in the line of duty, last year. The number of law enforcement officer deaths in 2018 is rising which is disappointing news as these figures show just how dangerous and difficult their job really is. Laguna Beach Police Department were hoping to give the vehicles a much needed facelift as they unveiled their patrol cars’ new design. However, once people saw the design, they instantly demanded the department to change it. Some criticised the new design was “a symbol of racism” toward immigrants. The Laguna Beach Police Department didn’t expect to receive any critisism when they unveiled the new design on their cars. They are in hot water with the city council for the wording on the patrol car doors, which features “POLICE” in American flag print. The word “police” features prominently across the side of each vehicle, painted in an Old Glory-inspired red, white and blue design. Some in the community take pride in the patriotic look, others find it problematic. The decals prompted criticism from a small minority of the public who said the stars and striped are offensive, and aggressive, particularly to immigrants. Mayor Pro Tem Steve Dicterow confirmed that people found the print to be racist. He has received a dozen emails of concern from residents after the city council approved the design. “Some of the words people used was that they felt it was threatening, intimidating, harassing and a symbol of racism,” Steve Dicterow said. Carrie Woodburn received more than 150 angry messages via phone calls, texts, voicemails and emails from people who disagreed with her assessment. Woodburn, whose parents served in the US military, said she wasn’t criticizing the appearance of the flag. “I don’t really care too much about the design, other than what I said — it’s bad art,” Woodburn said. The matter dates to February, when the proposed graphic that the council unanimously approved was a more muted version.“Clearly, the way it looks on the car is not what anyone expected it to look like,” Dicterow said. The council proposed a more muted black-and-white version of the text, a small group of protesters gathered near the beach Monday afternoon to show support for the patriotic design. So far the Laguna Beach Police explained that they haven’t received any negative comments. The reactions have been positive and those driving the vehicles haven’t heard complaints. “Every time I came to a stop sign, every time I came to a red light, somebody is telling me the car looks great. Every one of our members that drives the car loves it, and we look forward to keeping them the way they are”, Laguna Beach Police Cpl. Ryan Hotchkiss said. If you agree with this story then please SHARE with your friends on Facebook. If you have ever experienced something miraculous then you will relate to this particular story. Miracles can happen when we least expect them. One mother from Oakland, California has reason to believe in them. Her 4-year-old boy is survived an injury which could have cost him his life. Brijjanna Price believed she had lost her baby boy on the day he accidentally shot himself in the head. He suffered a serious injury to his head which should have killed him, after he found a gun under a bed at the home of his mom’s boyfriend. Price was informed by doctors at UCSF Benioff Children’s Hospital that her son had suffered serious brain damage and would more than likely never walk again. Little Na’vaun, defied all the odds after coming off of life support and out of a medically induce coma. The young boy is responding to those around him and has began eating on his own. 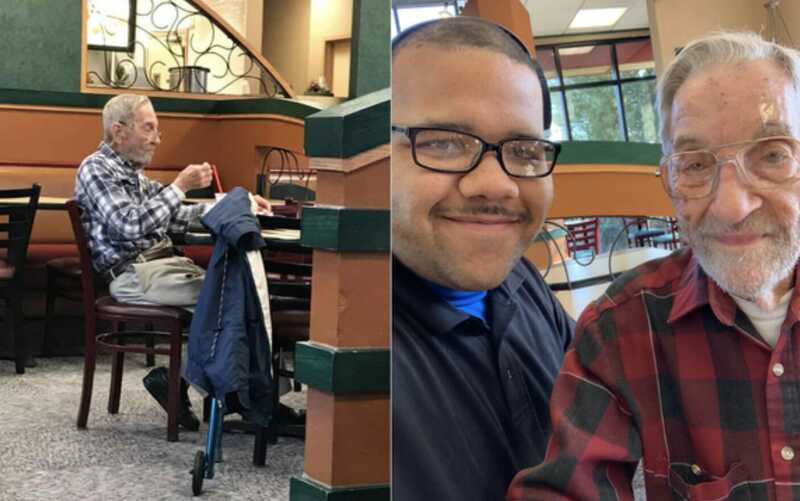 His remarkable progress was evident during videos his grandfather, Ramon Price, recorded and shared on Facebook. The 4-year-old can gives his grandad a high five and try to eat some food in a video clip. “Thanking God something new everyday he’s getting stronger and stronger,” Ramon wrote on Facebook. Thankfully Na’vaun is out of intensive care and gaining ground each day on his road to recovery.